*This exam is not accepted in Connecticut and Philadelphia, Texas. Texas requires food handler training for all individuals working in Texas food service establishments - (i.e., restaurants, cafes, bakeries, delis, mobile vendors, food trucks, bars, kiosks, convenience stores, and other food service employees). 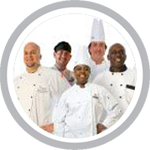 The Food Handler's Cards Training Program is easy to use and takes about 2 hours to complete. All content materials and exams are available in both English and Spanish. Our Food Handler Training Course is approved by the Texas Department of State Health Services (DSHS) and is valid throughout the entire State of Texas. Texas requires that a person-in-charge (PIC), owner, or employee of a food service establishment - (i.e., bars, restaurants, mobile vendors, food trucks, caterers, assisted-living, and day care centers) be a Certified Food Manager (CFM) as outlined in the Texas Food Code by successfully passing an ANSI-accredited and Texas Department of State Health Service approved - food safety certification exam. 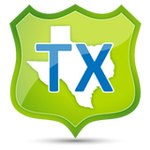 Our online Certification Exam and optional Food Manager Prep Course are fully approved by the Texas Department of State Health Services and are accepted anywhere in the state of Texas! Take the course, pass the exam, print your certificate, and get your Texas Food Manager’s Certification just like that! It is that easy! Our Food Manager Certification Online Exam is approved by the Texas Department of State Health Services (DSHS) and is valid throughout the entire State of Texas. Texas Approved Certified Food Manager Exam Online Provider (Learn2Serve.com - 360Training.com). Major cities served: Houston, San Antonio, Dallas, Austin, Fort Worth, El Paso, Arlington, Corpus Christi, Plano, Laredo, Lubbock, Garland, Irving, Amarillo, Brownsville, Grand Prairie, Pasadena, Mesquite, McKinney, McAllen, Killeen, Waco, Carrollton, Abilene, Beaumont, Frisco, Denton, Midland, Wichita Falls, Odessa, Round Rock, Richardson, The Woodlands, Tyler, Lewisville, College Station, San Angelo, Pearland, Allen, League City, Longview, Sugar Land. 1. I am permitted as as a retail food establishment in the state of Texas; must I obtain food manager certification? Food establishments handling, preparing, or serving exposed time/temperature control for safety foods, must employ a certified food manager. The manager’s original certificate is required to be posted in the establishment in a location conspicuous to consumers. The manager certification requirement was authorized by §437.0076 of the Texas Health and Safety Code and 25 TAC §229.177(b). 2. How do I obtain food manager certification? The food manager certification is obtained by passing a department approved certified food manager examination. 3. Where can I take the examination for certification? The food manager certification examination may be taken at any licensed program; test site; national program; or online examination provider. You will find the listing of accredited training programs, licensed test sites, and internet testing on our CFM website. 4. What examinations are accepted by the state as meeting the certified food manager requirement? Examinations that meet state requirement are offered through licensed training programs, test sites, and online. A list of each type of provider can be found on the link at the top of this page. 5. Are there any examinations accepted by the state that can be taken on the Internet? Examinations that meet the DSHS requirement for certification of food managers as an Internet Examination provider can be found on the link at the top of this page. Certificates issued upon the completion of the examinations are valid in Texas. 6. Where do I obtain my food manager certification examination results? Candidates who have taken a food manager examination should obtain examination results from the accredited program or licensed test site where the examination was administered. 7. What type of Certified Food Manager Certificate will I receive? An official Certified Food Manager Certificate is issued to each candidate upon passing the examination. This certificate must be posted in an area that is conspicuous to the consumers. The official National Certified Food Manager Certificate issued by each licensed national program varies in size and issuance process. Candidates should check with the examination provider for specific information. The official Online Certified Food Manager Certificate issued by each licensed online provider vary in size and issuance process. Candidates should check with the examination provider for specific information. 8. What if I lose my certificate? Candidates who have taken one of the DSHS approved national or online examinations must contact the examination provider for instructions on how to obtain a replacement certificate. 9. Are the CFM courses offered in any other languages than English? Yes, exams are available in English, Spanish, Chinese, Modern Chinese, Traditional Chinese, Vietnamese, Korean, Arabic, Japanese, French and French Canadian. Please see website for information regarding specific languages offered. 1. My food establishment is permitted by a local health jurisdiction; must I obtain food manager certification? Under §228.33(a) At least one employee that has supervisory and management responsibility and the authority to direct and control food preparation and service shall be a certified food protection manager who has shown proficiency of required information through passing a test that is part of an accredited program. Food establishments permitted by a local health jurisdiction should contact that specific jurisdiction to obtain information regarding their requirements for food manager certification. 2. Is my local health jurisdictions required to accept a DSHS approved examination certificate as meeting the training requirement? County health departments, public health districts, and city health departments must accept certificates issued for passing any DSHS approved examination as meeting the training and testing requirements of the Texas Health and Safety Code, Chapter 438. 3. Are there any additional fees that may be charged by a local health jurisdiction? A fee may be charged by a local health jurisdiction for a certificate issued to a certified food manager that has obtained an official certificate. This was authorized under Texas Health and Safety Code §438.046. Houston, San Antonio, Dallas, Austin, Fort Worth, El Paso, Arlington, Corpus Christi, Plano, Laredo, Lubbock, Garland, Irving, Amarillo, Brownsville, Grand Prairie, Pasadena, Mesquite, McKinney, McAllen, Killeen, Waco, Carrollton, Abilene, Beaumont, Frisco, Denton, Midland, Wichita Falls, Odessa, Round Rock, Richardson, The Woodlands, Tyler, Lewisville, College Station, San Angelo, Pearland, Allen, League City, Longview, Sugar Land.